Welcome to part one of a continuing series- "Famous People I Have Insulted or Pissed Off". 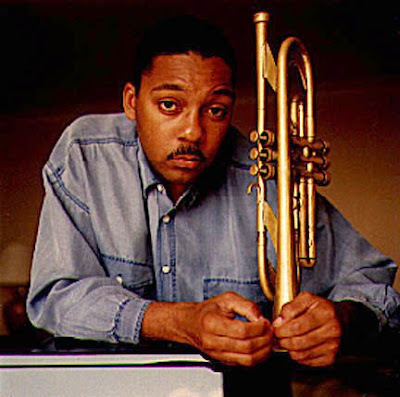 My first victim in the series is one of America's foremost Jazz musicians, Wynton Marsalis. How did I meet him, and insult him? Well, it was 1986. I had graduated from Rutgers, and I had no idea what I wanted to do with my life, and no direction. I had a degree in English, but no idea what to do with it. I was getting a lot of pressure from my family, my mom in particular, to do something with my life. They expected me to find a cure for cancer, or become a multi-billionaire, or something else reasonably easy to attain. As for me, I could care less. I was happy enough washing dishes at Red Lobster, working on the loading dock at the local home improvement store, or doing other "menial" work. I got fired from my job on the loading dock. The official reason was that I didn't wear my safety helmet. The real reason was because the general manager of the store hated me. I got along great with everyone else, but that seemed to bother him. He always looked pissed off whenever I got within ten feet of him. So I was out of work, and I still didn't know what to do with my life. I couldn't get unemployment, because I had been fired. And you know what? I still didn't care. I took a trip down to Virginia with my mom and grandmother, to visit our relatives there. Not exactly anyones idea of a good time. Our relations lived around the Richmond area, in New Kent and Chesterfield counties. They were doing pretty well. My cousin Sharon never went to college, but had her own temp agency. She turned down an offer to be vice president in charge of construction for Hilton Hotels (or so I was told by my aunt, never the most reliable source of information), because she didn't want to take a pay cut. She married a guy who owned his own mortgage bank. Cousin Susie and her husband Carl owned the Domino Pizza franchise for the Richmond area. They had a bunch of stores, and were doing very well for themselves. She went to school to become a nurse, but ended up driving a school bus before they got into the pizza business. I liked the area. It was quieter and more relaxed than New Jersey. It was away from my mom and grandmother, two harpies who seemed intent on making my life a total misery. I felt like I had enough of New Jersey, and it was time to make a change. Plus, I had no idea what else to do with my life. So I went down to Richmond to learn the pizza business. Cousin Sharons' son, Travis, had tried it, and almost ran one of the stores into the ground. He didn't have the best reputation. There was no way I was going to let anyone know I was related to them. Still, after a couple weeks people found out anyway, and acted like I had leprosy. They thought I was some sort of spy, which believe me, I wasn't. After a while, they decided I was cool. I started off as a driver, delivering pizzas in an area I had never been before- downtown Richmond, which included Church Hill, and the hillbilly section, and the state prison. Beautiful Belvedere Avenue. I spent a few weeks learning the area, until I had an accident. Then I moved inside as a management trainee. Some times we were short of drivers, and had a big rush of orders. At that time, Dominos still had their 45 minutes or less guarantee. If your pizza wasn't there in 45 minutes, it was free. In order not to spend the rest of the night giving out free pizzas, I would grab a bankroll, a hotbox, and a bag, and go on the road. I got one order to go to one of our usual customers in the area around VCU. Things were slowing down, so it was going to be my last run. The pizza was a bit late. I looked at the name, but it meant nothing to me - Marsalis. So I was off to make sure Mr. Marsalis, whoever it was, didn't get a free pizza. Being the competitor that I am, if he wanted a free pizza, he was going to have to kill me for it. I didn't like giving anything away for free. For those of you not in the know, Wyntons' (and saxophonist and ex Tonight Show bandleader Branfords') dad Ellis Marsalis, was a professor of Jazz Studies at VCU. That was his house I was going to. So I pull up in front of the nice brick house, and ring the bell. A haughty looking neatly dressed black guy opens the door, and looks down his nose at me. No "hi", or "hello", just "It's late." "Not by my watch it isn't, and it's my watch that counts." I can't remember exactly how much it was, but it was something like $9.87, or some odd number like that. The customer hands me $10, which I pocket. Then he asks for change. "What? You want change? You must be kidding me!" "No, I'm not. I want my change." The only thing I had that jingled in my pocket was my keys. "I don't have any coins." The customer complains, so I grumble back at him. He looks at me. "Do you know who I am? ", he says, pulling himself up and looking rather self-important. "I don't know, and I don't care. All I know is that you're a too cheap to give a guy a few cents for a tip. That doesn't say too much for you in my book." That stops him, so I give him the pizza and walk back to my car and drive away. A couple years later, I am back in New Jersey, trying to start my acting career. I pick up the Sunday Newark Star-Ledger. It has Parade Magazine as a supplement. In it is an interview with - well, you guessed it, the high and mighty cheapskate. He talks about his music, and blah blah blah. Near the end of the interview, he talked about how you have to not get too full of yourself, and try to keep things in perspective, etc. He talked about the "surly pizza man who came to his door, and took him down a few notches. Yup, that surly pizza man was me.